There were close to 1,000 photos I gathered for the slideshow. Some are scanned in from old slides and photos from before I was born. Others are from Christmas gatherings this year. I find looking through them transfixing, and so did many of the family members visiting. I’m not a fan of large gatherings, but looking at the pictures made me nostalgic for past family Christmas gatherings. 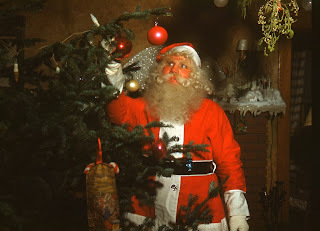 Nostalgic for folks who are no longer around, like my gramps dressed up as Santa. Nostalgic for my nephew Drew smiling as he played with his older cousins. Nostalgic for my dad with his teasing smile. Most of the pictures are of happy smiling people. Of people eating, laughing, and talking. 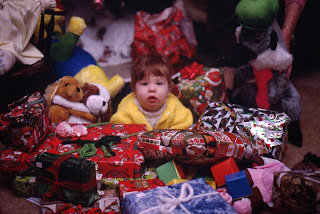 Of children surrounded by more gifts than they know what to do with. Of course, the images don’t quite capture some of the less than photogenic moments. Moments, like our cat Bob knocking over a windowsill candle which broke and caught some tissue paper on fire. Or, the food that did not turn out like planned. Or, the keys locked in a running car in front of our house. Or, the folks who did not show up. Or, the treasured tree ornaments that broke. I started thinking about what that first Christmas must have been like for Jesus and his family. We mostly think of them in an idealized setting, as depicted in manger scenes, with shepherds, angels, and wise men looking on. The reality, of course, was a lot messier. As newlyweds with a child due too soon, Mary and Joseph certainly endured comments and knowing looks in their town. They also had had angelic visits foretelling them about the special child to whom Mary would give birth. Despite all that, they probably just wanted to get back home to share the joy of their new baby with family and friends. In subsequent years, Mary and Joseph probably told their own family stories about the day that Jesus was born. And, about the funny things that happened on his birthdays in later years. 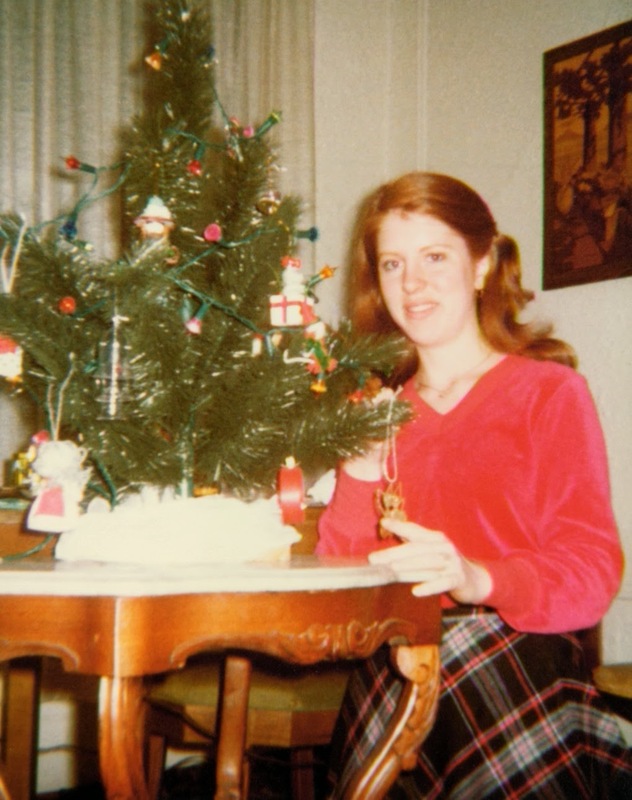 While Jesus had a much greater mission here on Earth, I’m sure he treasured that time with his family, just being together and discussing the joys and sorrows of Christmases past. I hope you enjoyed your Christmas and got to spend it with loved ones. I also hope you have the opportunity to get out some of those old photos and relive images of Christmases past. And, that you take some time to think back to that very first Christmas and what the baby Jesus would come to mean to the whole world.